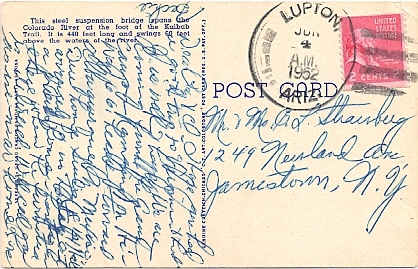 Hand cancellation: "LUPTON, ARIZ. JUN 28 1946". 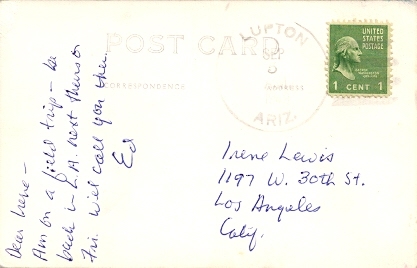 Hand cancellation: "LUPTON, ARIZ. SEP 5 1949". 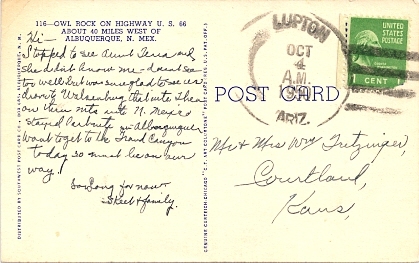 Hand cancellation: "LUPTON, ARIZ. OCT 4 1950". 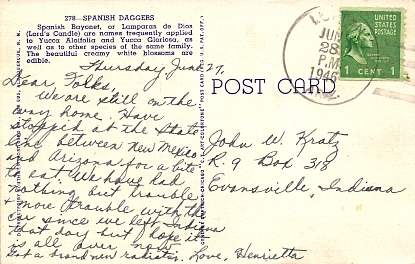 Hand cancellation: "LUPTON, ARIZ. JUN 4 1952". 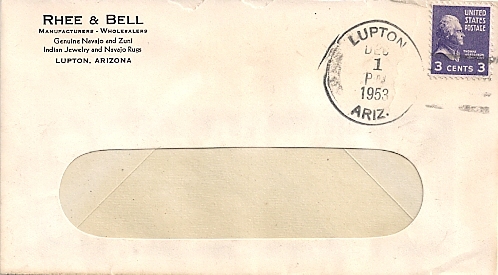 Hand cancellation: "LUPTON, ARIZ. DEC 1 1953". 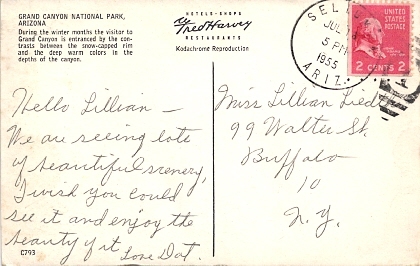 Hand cancellation: "ALLANTOWN, ARIZ. JUL 5 1927". 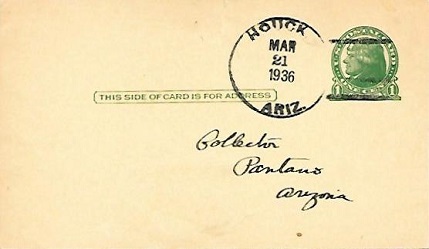 Hand cancellation: "HOUCK, ARIZ. MAR 21 1936". 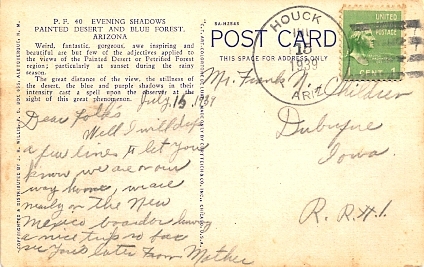 Hand cancellation: "HOUCK, ARIZ. JUL 15 1939". 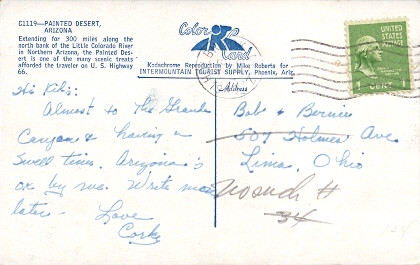 Hand cancellation: "HOUCK, ARIZ. DEC 4 1942". 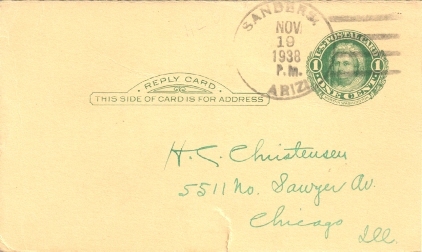 Hand cancellation: "SANDERS, ARIZ. NOV 19 1938". 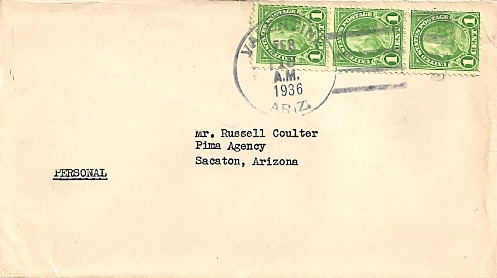 Hand cancellation: "SANDERS, ARIZ. AUG 13 194?". 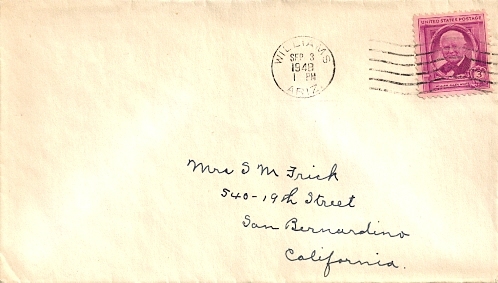 Hand cancellation: "SANDERS, ARIZ. APR 12 1955". 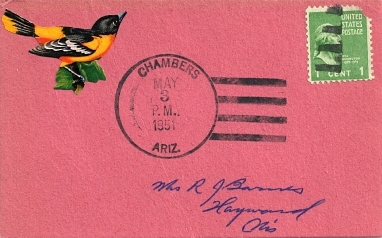 Hand cancellation: "CHAMBERS, ARIZ. MAY 3 1951". 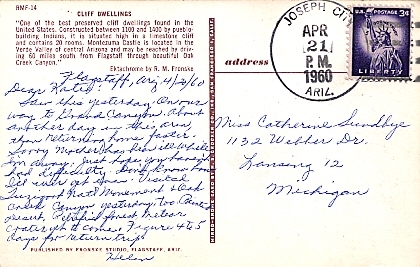 Hand cancellation: "CHAMBERS, AZ 86502 MAR 23 1970". 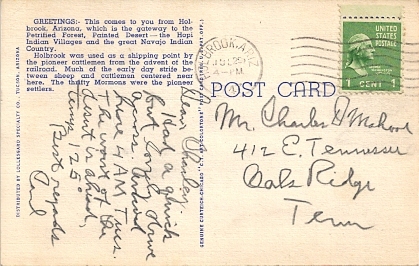 Hand cancellation: "NAVAJO, ARIZ. DEC 12 1934". 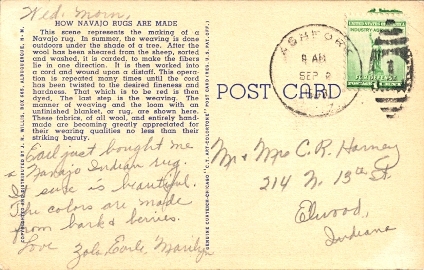 Hand cancellation: "NAVAJO, ARIZ. NOV 11 1937". 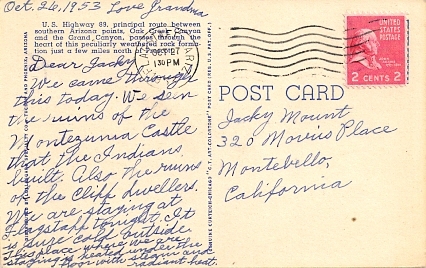 Hand cancellation: "NAVAJO, ARIZ. APR 14 1962". 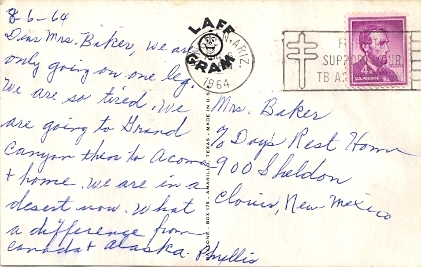 Hand cancellation: "NAVAJO, AZ 86509 OCT 10 1969". 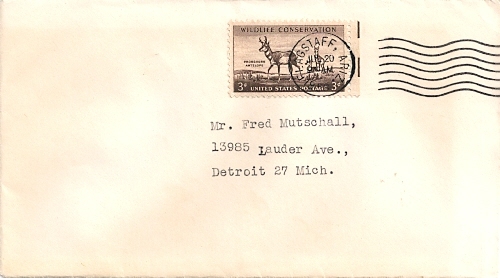 Hand cancellation: "PETRIFIED FOREST NATIONAL PARK RUR. 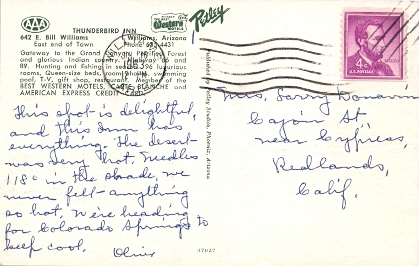 BR., HOLBROOK, AZ 86025 AUG 14 1967". 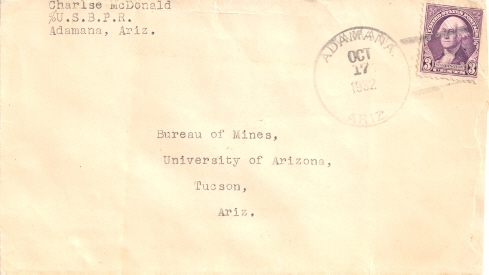 Hand cancellation: "ADAMANA, ARIZ. OCT 17 1932". 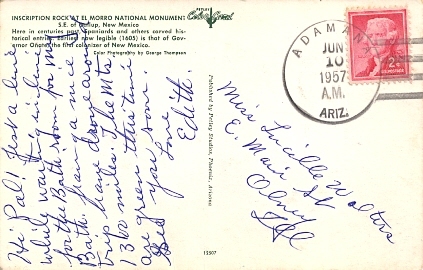 Hand cancellation: "ADAMANA, ARIZ. JUN 10 1957". 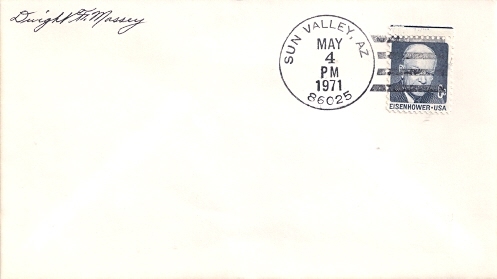 Hand cancellation: "SUN VALLEY, AZ 86025 MAY 4 1971". 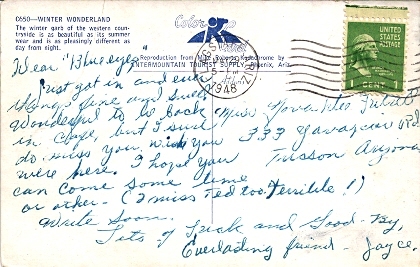 Machine cancellation: "HOLBROOK, ARIZ. AUG 7 1940". 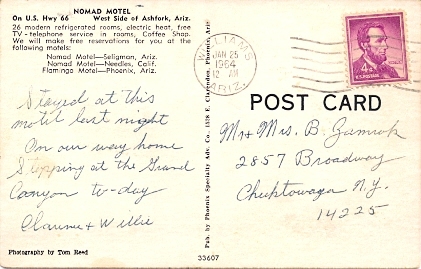 Machine cancellation: "HOLBROOK, ARIZ. JAN 24 1947". 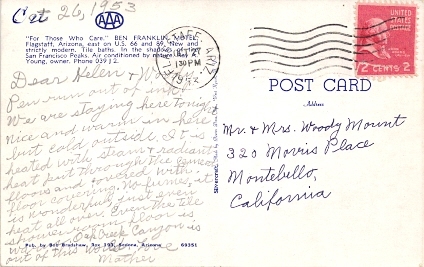 Machine cancellation: "HOLBROOK, ARIZ. JUL 29 1947". 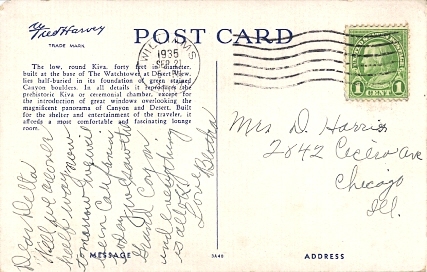 Machine cancellation: "HOLBROOK, ARIZ. JUL 23 1948". 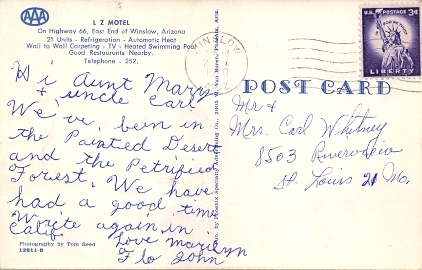 Machine cancellation: "HOLBROOK, ARIZ. JUL 6 1950". 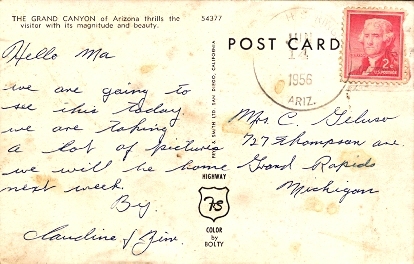 Machine cancellation: "HOLBROOK, ARIZ. JUN 20 1957". 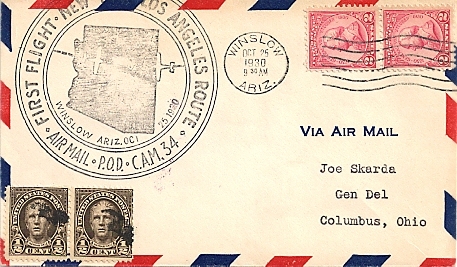 Machine cancellation: "HOLBROOK, ARIZ. AUG 1 1963". 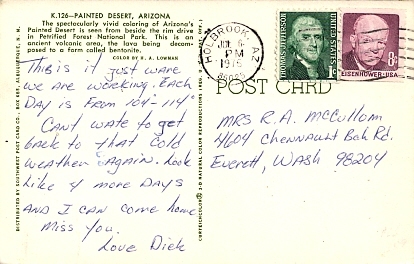 Machine cancellation: "HOLBROOK, ARIZ. OCT 7 1965". 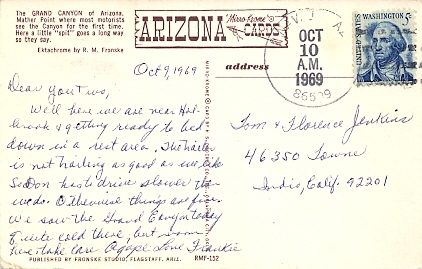 Machine slogan cancellation: "HOLBROOK, ARIZ. APR 9 1966 | NATIONAL PARK SERVICE 50TH ANNIVERSARY |". 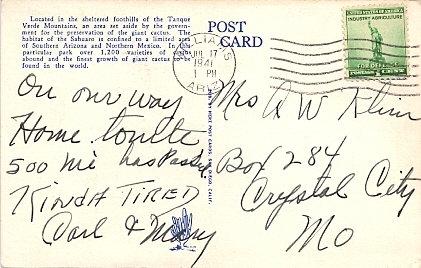 Machine cancellation: "HOLBROOK, AZ 86025 SEP 2 1967". 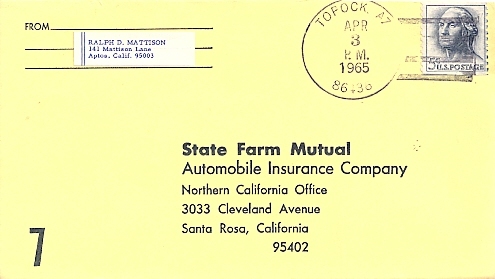 Machine cancellation: "HOLBROOK, AZ 86025 APR 29 1970". 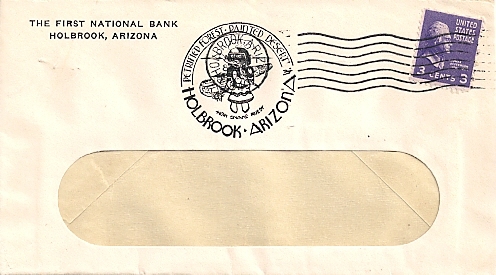 Machine cancellation: "HOLBROOK, AZ 86025 JUL 6 1975". 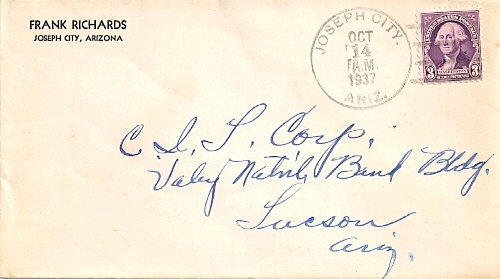 Hand cancellation: "JOSEPH CITY, ARIZ. OCT 14 1937". 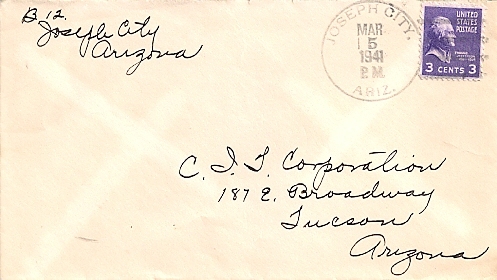 Hand cancellation: "JOSEPH CITY, ARIZ. MAR 5 1941". 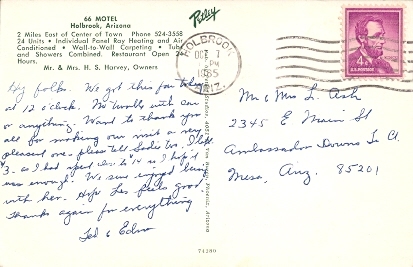 Hand cancellation: "JOSEPH CITY, ARIZ. APR 21 1960". 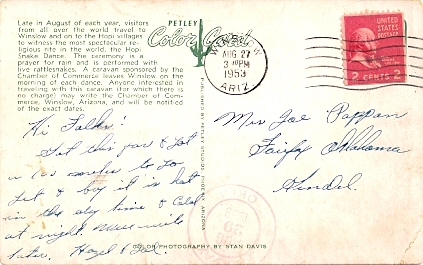 Hand cancellation: "JOSEPH CITY, ARIZ. AUG 5 1960". 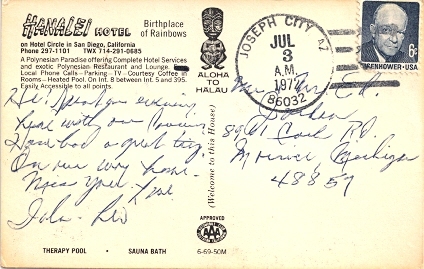 Hand cancellation: "JOSEPH CITY, AZ 86032 JUL 3 1972". 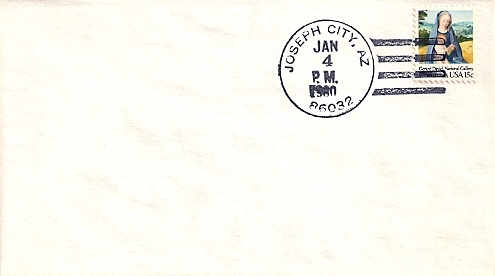 Hand cancellation: "JOSEPH CITY, AZ 86032 JAN 4 1980". 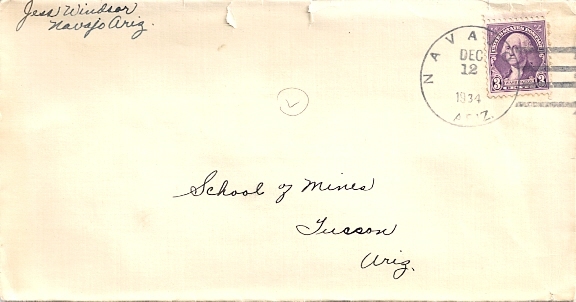 Machine cancellation: "WINSLOW, ARIZ. OCT 25 1930". 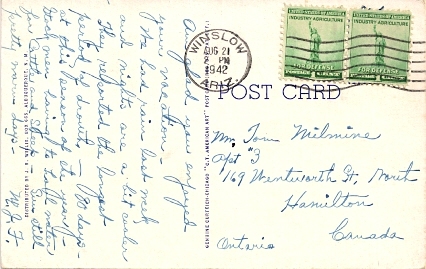 Machine cancellation: "WINSLOW, ARIZ. SEP 5 1937". 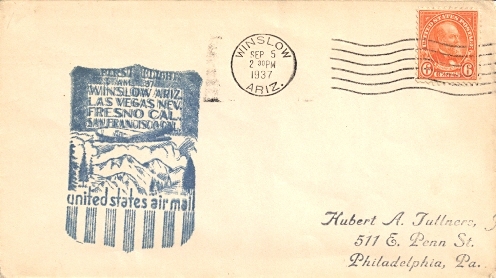 Machine cancellation: "WINSLOW, ARIZ. AUG 21 1942". 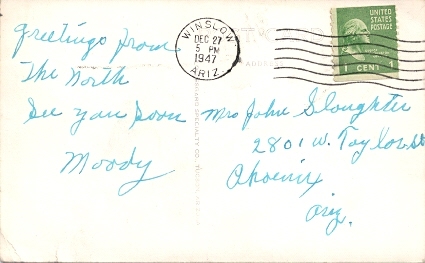 Machine cancellation: "WINSLOW, ARIZ. DEC 27 1947". 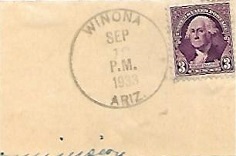 Machine cancellation: "WINSLOW, ARIZ. SEP 23 1948". 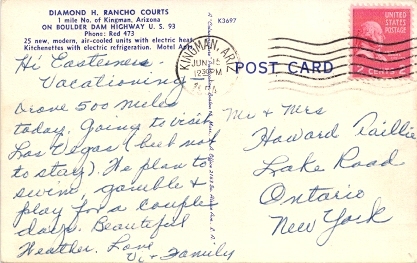 Machine cancellation: "WINSLOW, ARIZ. JUN 16 1950". 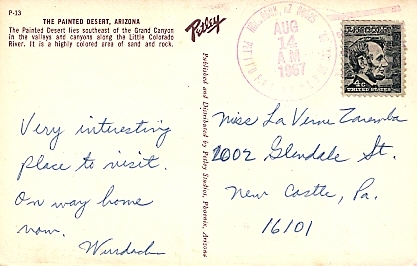 Machine cancellation: "WINSLOW, ARIZ. AUG 22 1953". 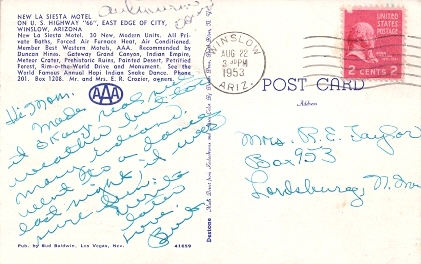 Machine cancellation: "WINSLOW, ARIZ. AUG 27 1953". 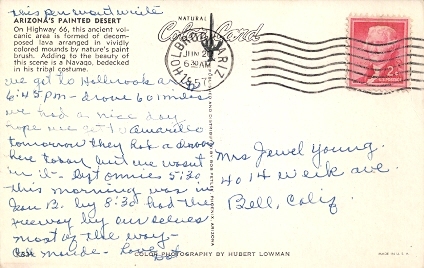 Machine cancellation: "WINSLOW, ARIZ. JUL 26 1956". 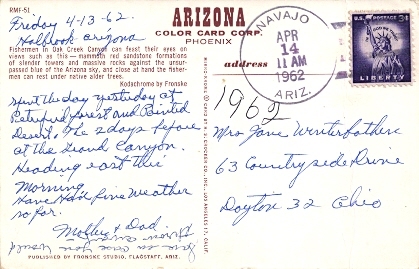 Machine cancellation: "WINSLOW, ARIZ. APR 18 1960". 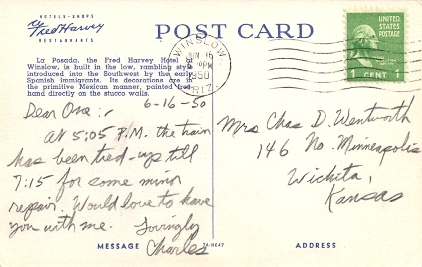 Machine cancellation: "WINSLOW, ARIZ. SEP 5 1962". 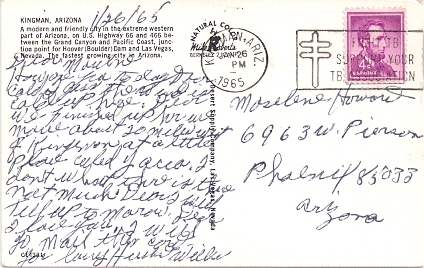 Machine cancellation: "WINSLOW, AZ 86047 OCT 5 1969". 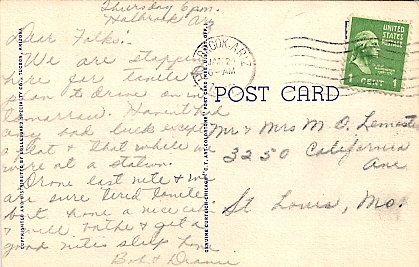 Two different hand cancellations: "TWO GUN TOWN RUR. BR., FLAGSTAFF, AZ 86001 OCT 26 1967" and "TWO GUN TOWN RUR. 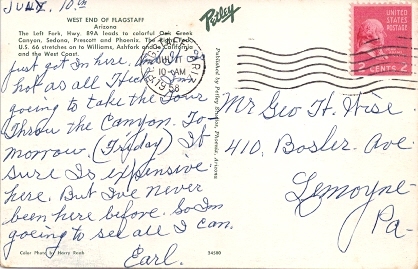 BR., FLAGSTAFF, AZ USPO OCT 26 1967". 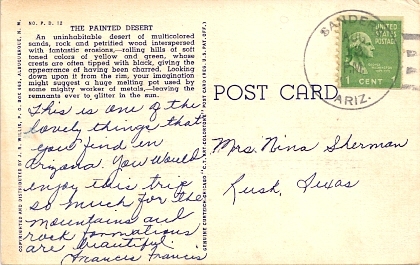 Hand cancellation: "WINONA, ARIZ. SEP 19 1933". 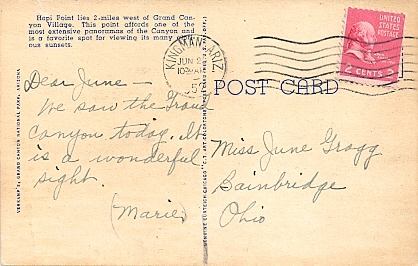 Machine cancellation: "FLAGSTAFF, ARIZ. JUN 11 1937". 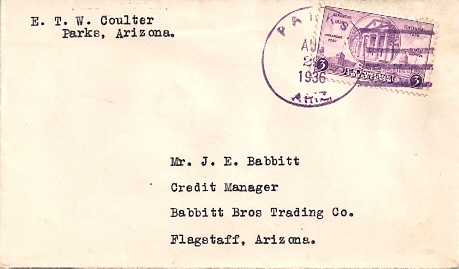 Machine cancellation: "FLAGSTAFF, ARIZ. NOV 10 1937". 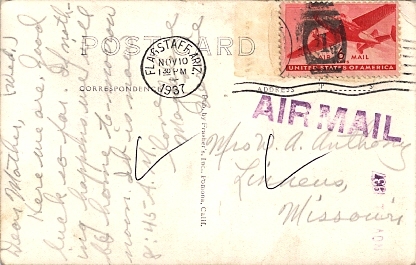 Machine cancellation: "FLAGSTAFF, ARIZ. OCT 23 1939". 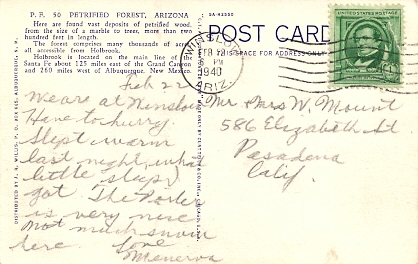 Machine cancellation: "FLAGSTAFF, ARIZ. NOV 9 1941". 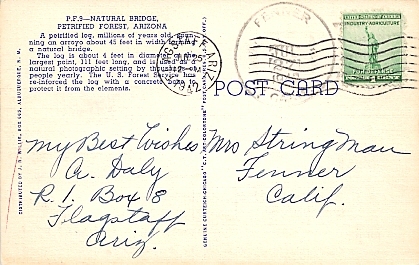 Machine cancellation: "FLAGSTAFF, ARIZ. JUL 25 1942". 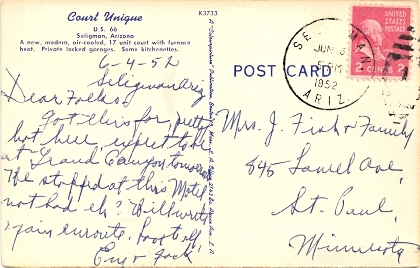 Machine cancellation: "FLAGSTAFF, ARIZ. MAY 29 1948". 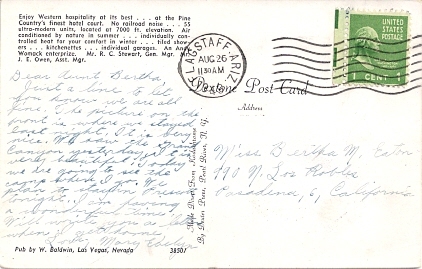 Machine cancellation: "FLAGSTAFF, ARIZ. AUG 18 1949". 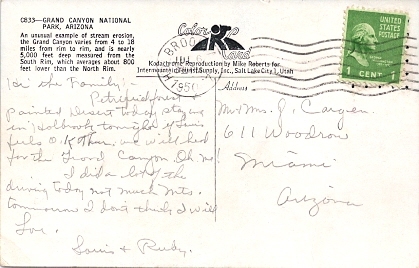 Machine cancellation: "FLAGSTAFF, ARIZ. AUG 26 1949". 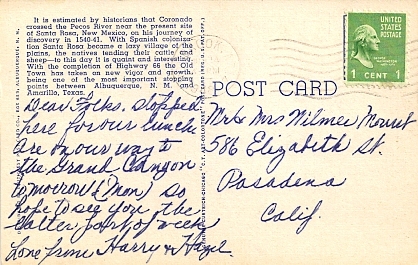 Machine cancellation: "FLAGSTAFF, ARIZ. MAY 28 1950". 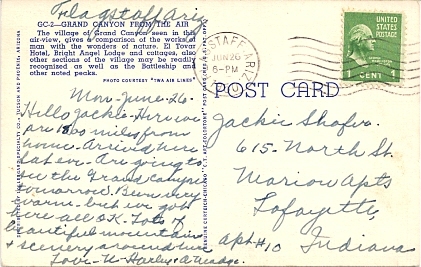 Machine cancellation: "FLAGSTAFF, ARIZ. JUN 26 1950". 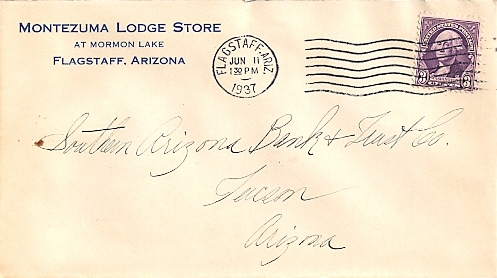 Machine cancellation: "FLAGSTAFF, ARIZ. JUN 20 1951". 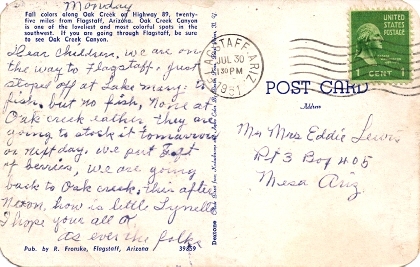 Machine cancellation: "FLAGSTAFF, ARIZ. JUL 30 1951". 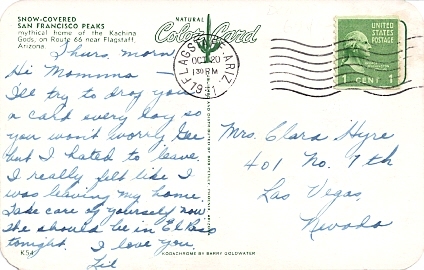 Machine cancellation: "FLAGSTAFF, ARIZ. OCT 20 1951". 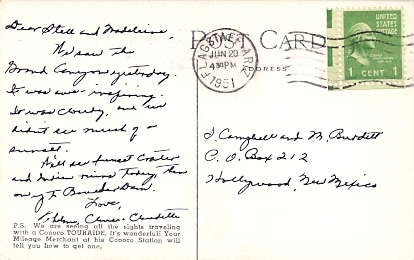 Machine cancellation: "FLAGSTAFF, ARIZ. AUG 22 1953". 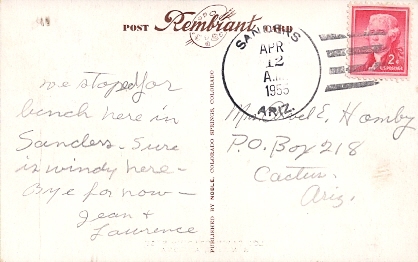 Machine cancellation: "FLAGSTAFF, ARIZ. APR 23 1955". 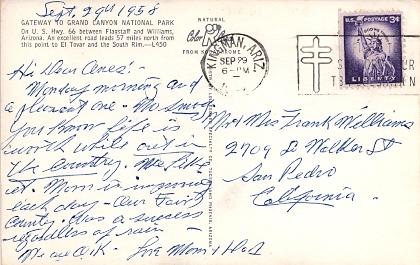 Machine cancellation: "FLAGSTAFF, ARIZ. SEP 18 1955". 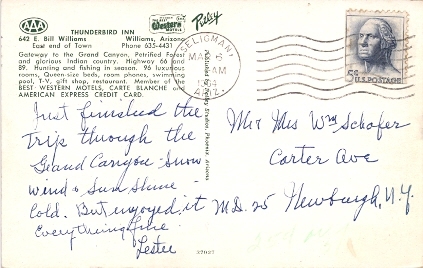 Machine cancellation: "FLAGSTAFF, ARIZ. JUL 20 1956". 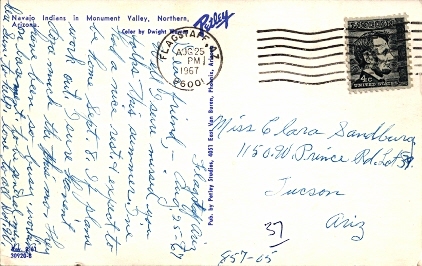 Machine cancellation: "FLAGSTAFF, ARIZ. JUN 5 1958". 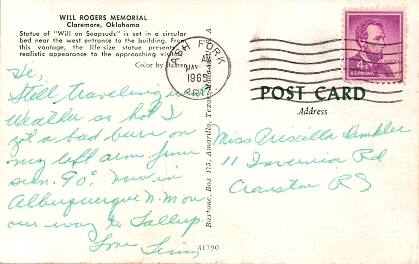 Machine cancellation: "FLAGSTAFF, ARIZ. JUL 11 1958". 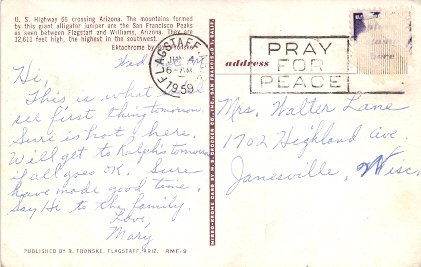 Machine slogan cancellation: "FLAGSTAFF, ARIZ. JUN 4 1959 | PRAY FOR PEACE |". 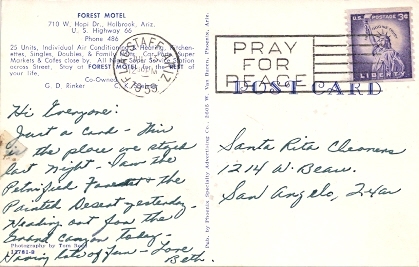 Machine slogan cancellation: "FLAGSTAFF, ARIZ. JUL 13 1959 | PRAY FOR PEACE |". 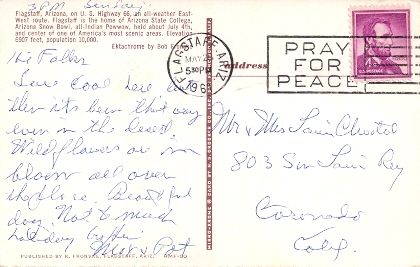 Machine slogan cancellation: "FLAGSTAFF, ARIZ. MAY 28 1961 | PRAY FOR PEACE |". 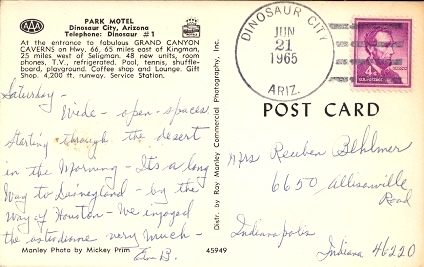 Machine cancellation: "FLAGSTAFF, ARIZ. JUN 23 1964". 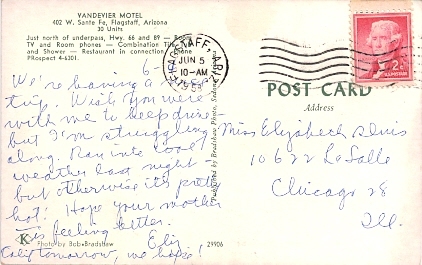 Machine cancellation: "FLAGSTAFF, AZ 86001 JUN 6 1967". 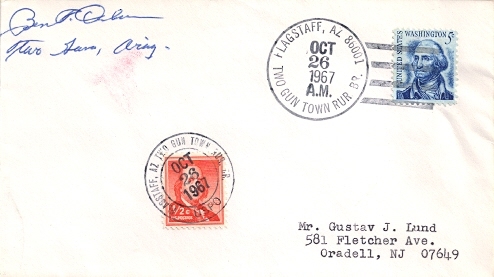 Machine cancellation: "FLAGSTAFF, AZ 86001 AUG 25 1967". 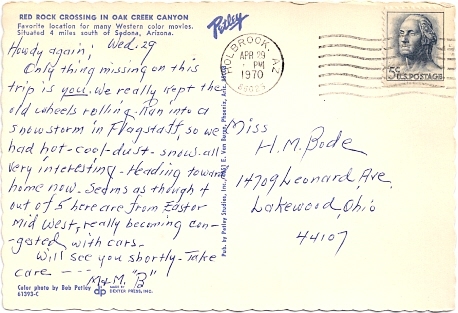 Machine cancellation: "FLAGSTAFF, AZ 86001 DEC 12 1973". 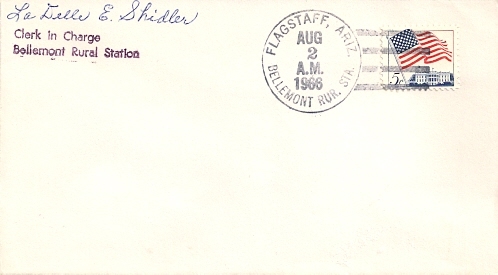 Machine cancellation: "FLAGSTAFF, AZ 86001 SEP 6 1979". 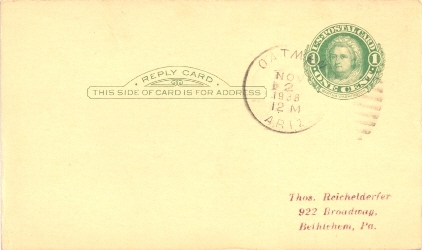 Hand cancellation: "N.A.U. 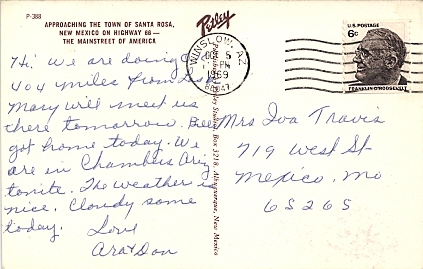 STA., FLAGSTAFF, AZ USPO SEP 4 1979". Hand cancellation: "BELLEMONT RUR. 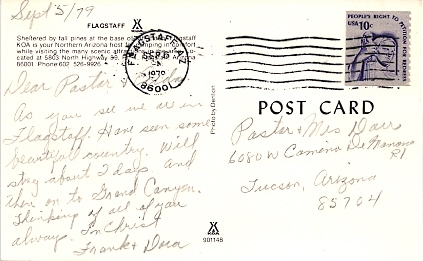 STA., FLAGSTAFF, ARIZ. AUG 2 1966". Hand cancellation: "BELLEMONT RUR. 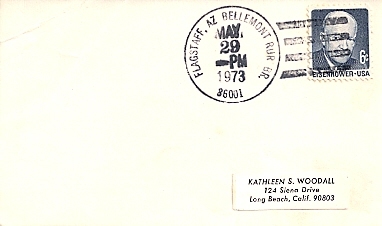 BR., FLAGSTAFF, AZ 86001 MAY 29 1973". 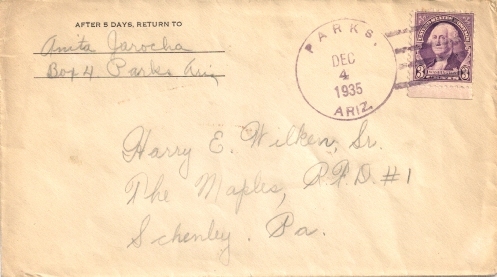 Hand cancellation: "PARKS, ARIZ. DEC 4 1935". 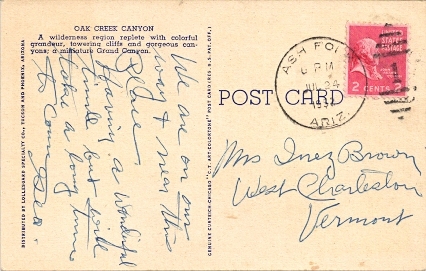 Hand cancellation: "PARKS, ARIZ. AUG 29 1936". 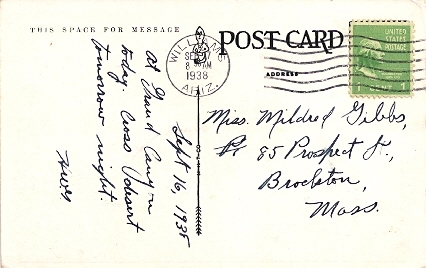 Machine cancellation: "WILLIAMS, ARIZ. SEP 21 1935". 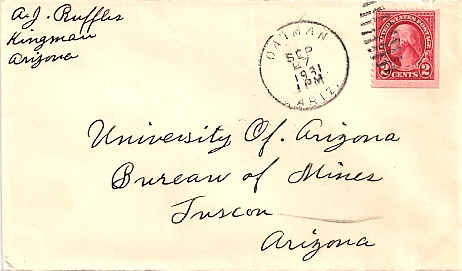 Machine cancellation: "WILLIAMS, ARIZ. SEP 17 1938". 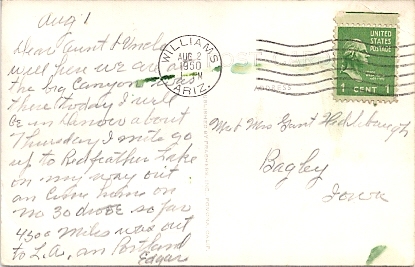 Machine cancellation: "WILLIAMS, ARIZ. JUL 17 1941". 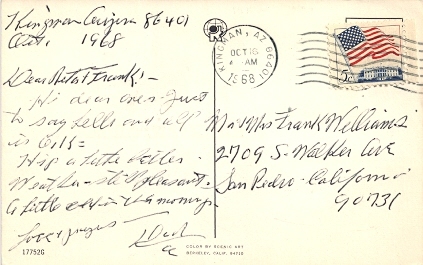 Machine cancellation: "WILLIAMS, ARIZ. SEP 3 1948". 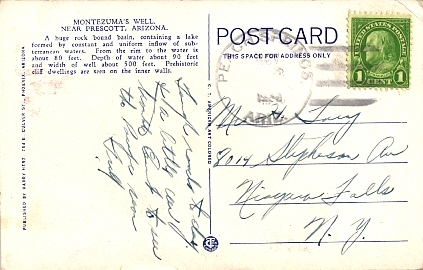 Machine cancellation: "WILLIAMS, ARIZ. AUG 2 1950". 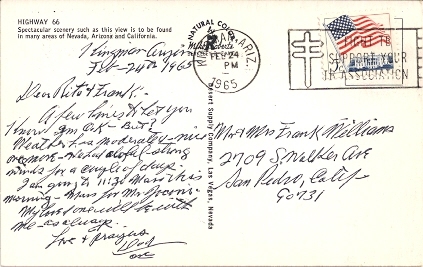 Machine cancellation: "WILLIAMS, ARIZ. JUN 9 1952". 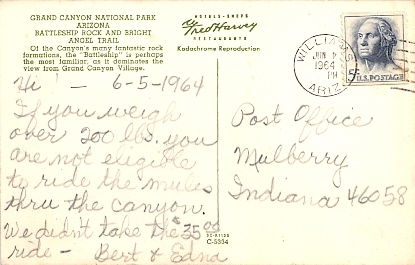 Machine slogan cancellation: "WILLIAMS, ARIZ. AUG 20 1958 | Remember Only you can PREVENT FOREST FIRES |". 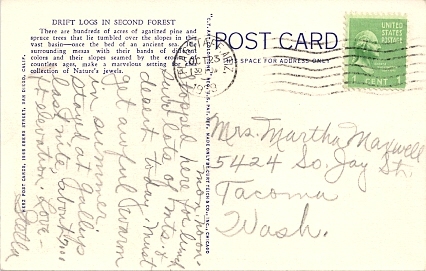 Machine slogan cancellation: "WILLIAMS, ARIZ. AUG 3 1959 | Remember Only you can PREVENT FOREST FIRES |". 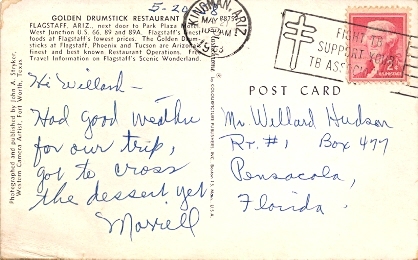 Machine cancellation: "WILLIAMS, ARIZ. MAY 3 1961". 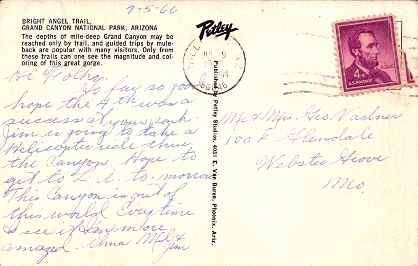 Machine cancellation: "WILLIAMS, ARIZ. JUL 16 1963". 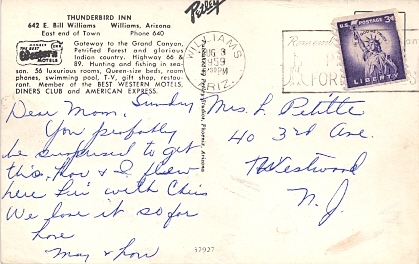 Machine cancellation: "WILLIAMS, ARIZ. JAN 25 1964". 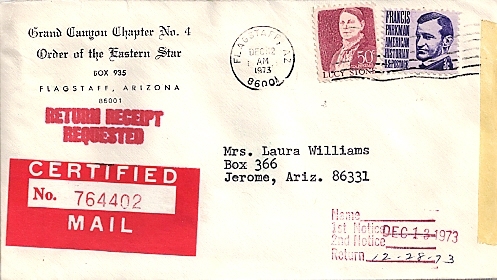 Machine cancellation: "WILLIAMS, ARIZ. JUN 4 1964". 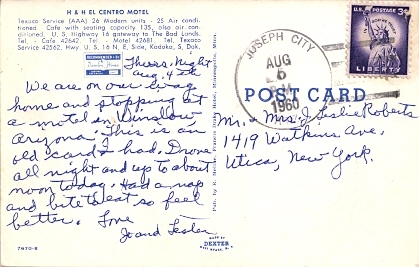 Machine cancellation: "WILLIAMS, AZ 86046 JUL 9 1966". 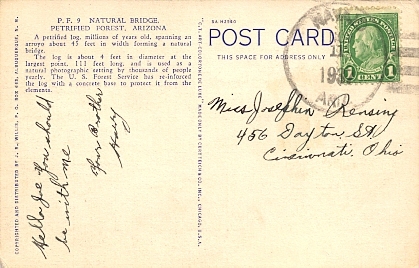 This cacheted cover commemorates the 100th anniversary of the Williams post office. 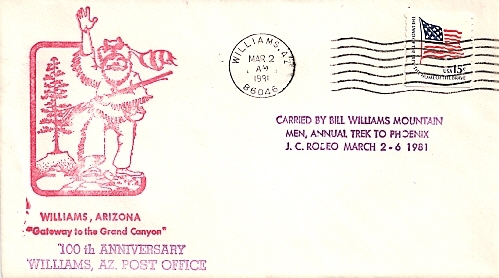 Machine cancellation: "WILLIAMS, AZ 86046 MAR 2 1981". 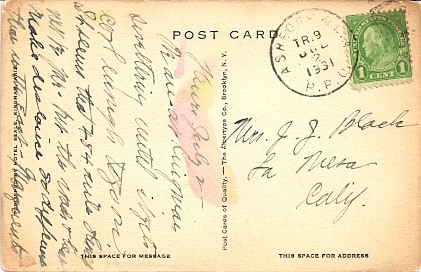 Hand cancellation: "ASHFORK & L. A. R. P. O. JUL 2 1931". 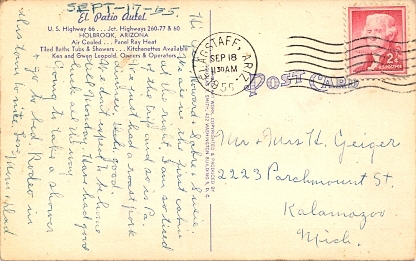 Hand cancellation: "ASHFORK, ARIZ. SEP 2 1943 ( 1 )". 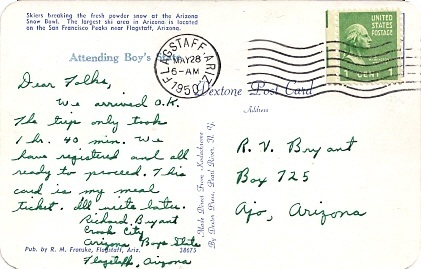 Hand cancellation: "ASHFORK, ARIZ. JUL 24 1952 ( 1 )". 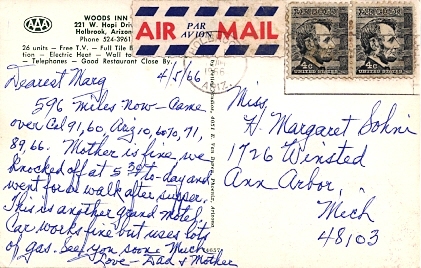 Machine cancellation: "ASHFORK, ARIZ. MAY 3 1965". 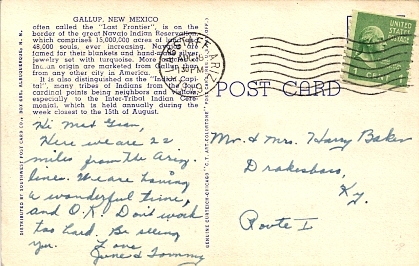 On back: hand cancellation: "REGISTERED, SELIGMAN, ARIZ. APR 29 1944". 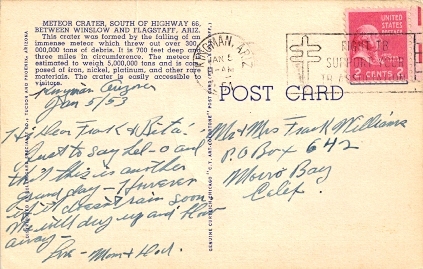 Hand cancellation: "SELIGMAN, ARIZ. JUN 5 1952". 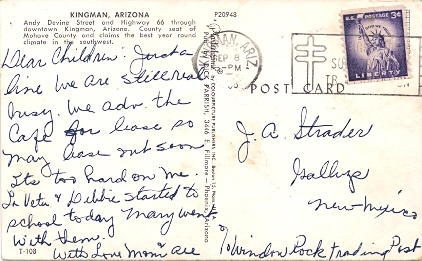 Hand cancellation: "SELIGMAN, ARIZ. JUL 16 1955 ( 1 )". 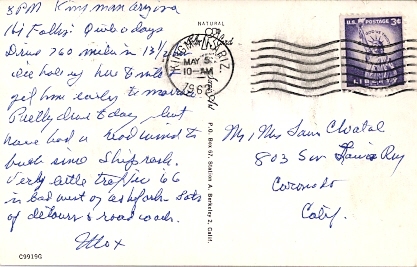 Machine cancellation: "SELIGMAN, ARIZ. MAR 6 1964". 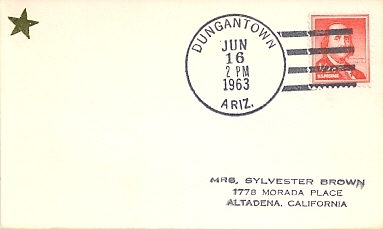 Hand cancellation: "DUNGANTOWN, ARIZ. JUN 16 1963". 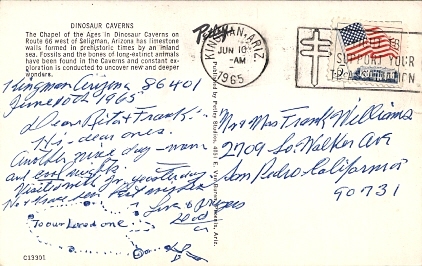 Hand cancellation: "DINOSAUR CITY, ARIZ. JUN 21 1965". 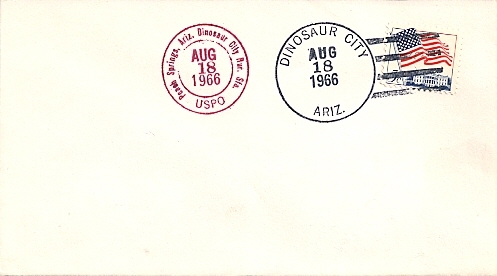 Two different hand cancellations: "DINOSAUR CITY, ARIZ. AUG 18 1966" and "Dinosaur City Rur. 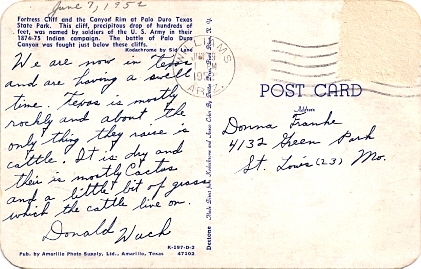 Sta., Peach Springs, Ariz. USPO AUG 18 1966". 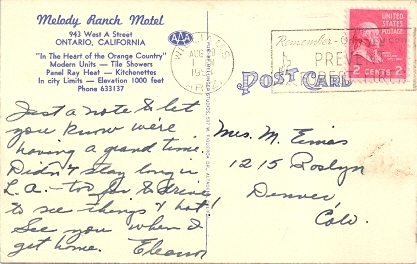 Hand cancellation: "PEACH SPRINGS, ARIZ. NOV ?3 1926". 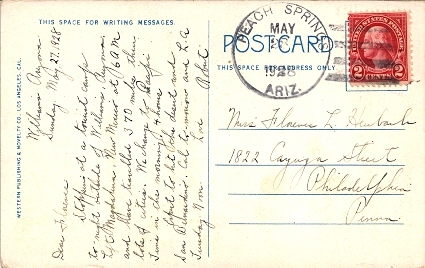 Hand cancellation: "PEACH SPRINGS, ARIZ. MAY 28 1928". 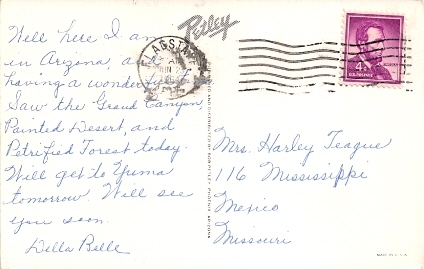 Hand cancellation: "PEACH SPRINGS, ARIZ. JUN 14 1956". 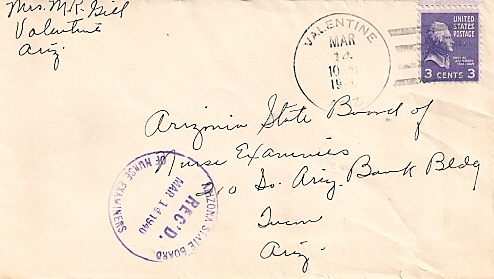 Hand cancellation: "VALENTINE, ARIZ. FEB 14 1931". 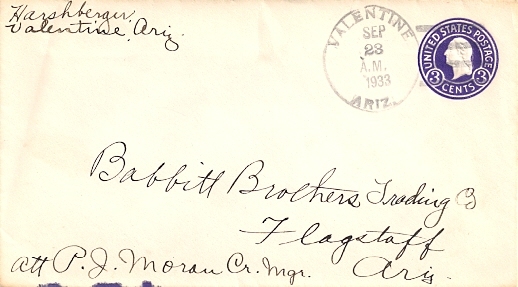 Hand cancellation: "VALENTINE, ARIZ. SEP 23 1933". 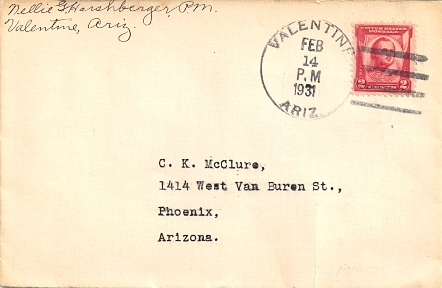 Hand cancellation: "VALENTINE, ARIZ. FEB 18 1936". 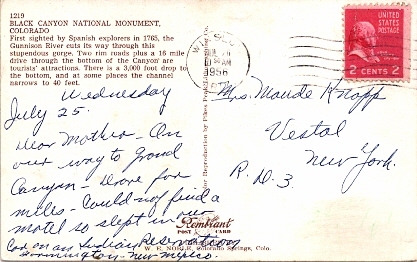 Hand cancellation: "VALENTINE, ARIZ. MAR 14 1940". 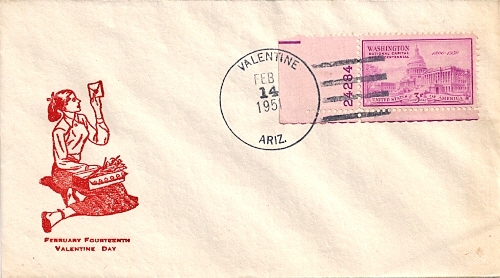 Hand cancellation: "VALENTINE, ARIZ. FEB 14 1951". 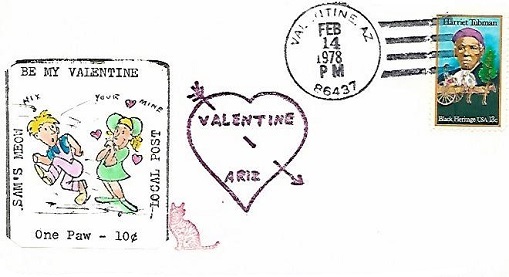 Hand cancellation: "VALENTINE, AZ 86437 FEB 14 1978". 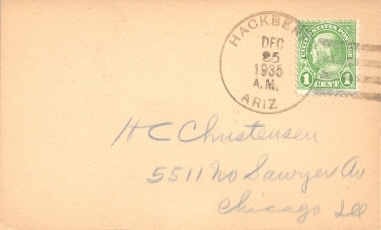 Hand cancellation: "HACKBERRY, ARIZ. DEC 25 1935". 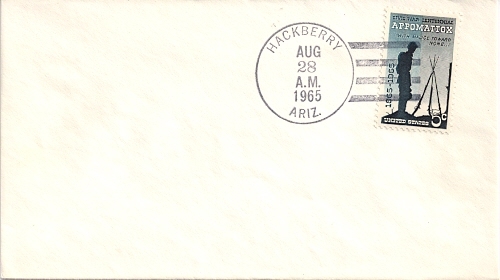 Hand cancellation: "HACKBERRY, ARIZ. AUG 28 1965". 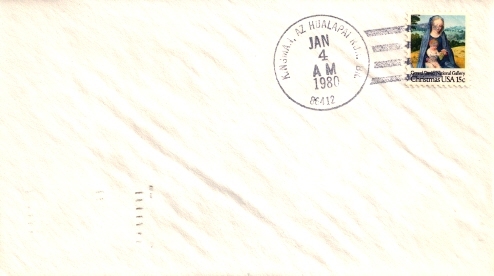 Hand cancellation: "HUALAPAI RUR. BR., KINGMAN, AZ 86412 JAN 4 1980". 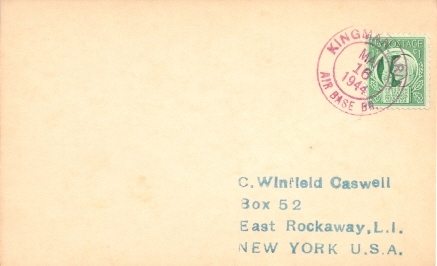 Hand cancellation: "AIR BASE BR., KINGMAN, ARIZ. MAR 16 1944". 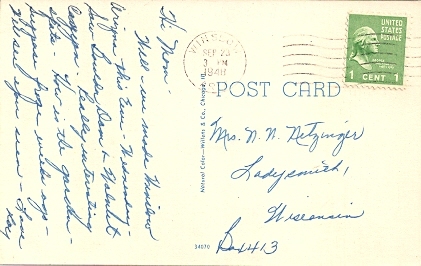 Hand cancellation: "KINGMAN, ARIZ. SEP 23 1927". 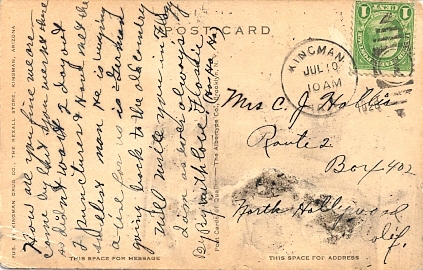 Hand cancellation: "KINGMAN, ARIZ. JUL 10 1928". 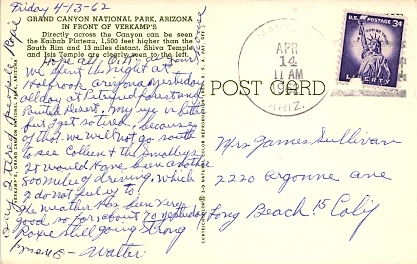 Hand cancellation: "KINGMAN, ARIZ. MAR 19 1940". 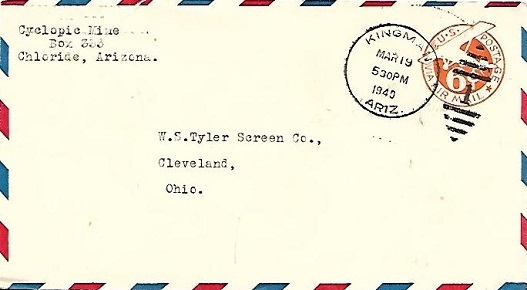 Machine slogan cancellation: "KINGMAN, ARIZ. APR 19 1950 | FIGHT TB SUPPORT YOUR TB ASSOCIATION |". 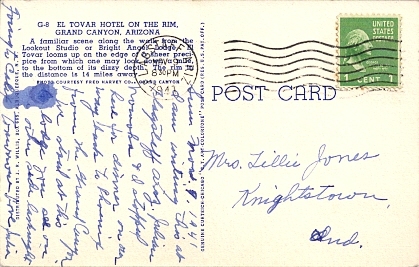 Hand cancellation: "KINGMAN, ARIZ. JUN 20 1952". Machine slogan cancellation: "KINGMAN, ARIZ. JAN 5 1954 | FIGHT TB SUPPORT YOUR TB ASSOCIATION |". 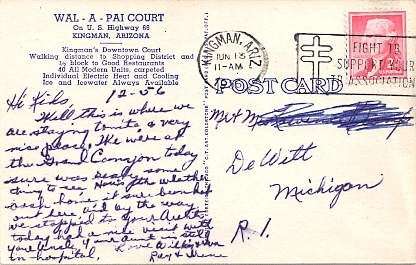 Machine cancellation: "KINGMAN, ARIZ. JUN 15 1954". 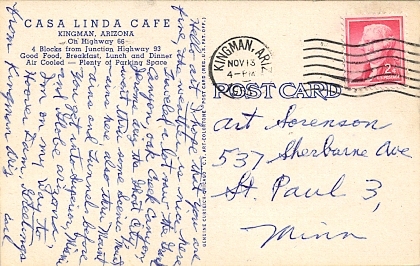 Machine cancellation: "KINGMAN, ARIZ. NOV 13 1954". 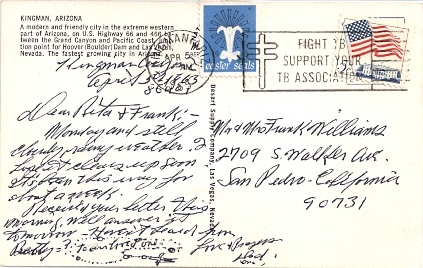 Machine slogan cancellation: "KINGMAN, ARIZ. JUN 13 1956 | FIGHT TB SUPPORT YOUR TB ASSOCIATION |". 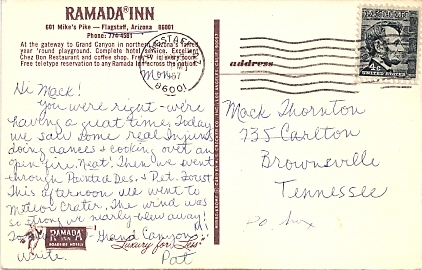 Machine slogan cancellation: "KINGMAN, ARIZ. MAY 21 1958 | FIGHT TB SUPPORT YOUR TB ASSOCIATION |". 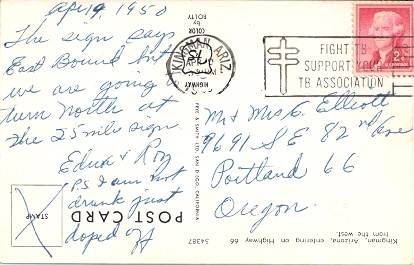 Machine slogan cancellation: "KINGMAN, ARIZ. SEP 8 1958 | FIGHT TB SUPPORT YOUR TB ASSOCIATION |". Machine slogan cancellation: "KINGMAN, ARIZ. SEP 29 1958 | FIGHT TB SUPPORT YOUR TB ASSOCIATION |". 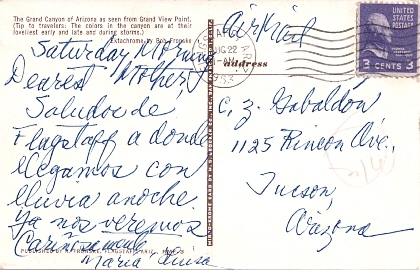 Machine slogan cancellation: "KINGMAN, ARIZ. JUL 12 1960 | FIGHT TB SUPPORT YOUR TB ASSOCIATION |". Machine slogan cancellation: "KINGMAN, ARIZ. NOV 9 1961 | FIGHT TB SUPPORT YOUR TB ASSOCIATION |". 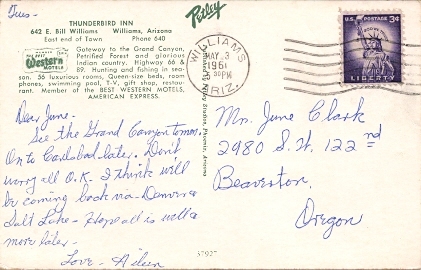 Machine cancellation: "KINGMAN, ARIZ. MAY 5 1962". 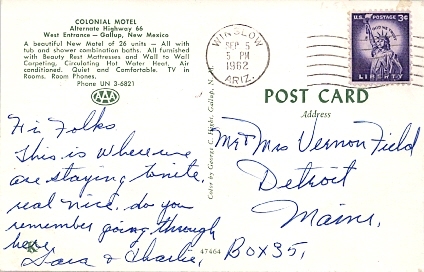 Machine slogan cancellation: "KINGMAN, ARIZ. AUG 6 1964 | FIGHT TB SUPPORT YOUR TB ASSOCIATION |". 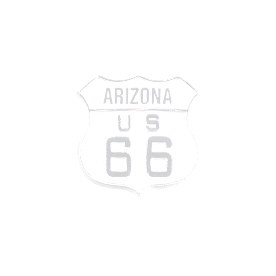 Machine slogan cancellation: "KINGMAN, ARIZ. JAN 26 1965 | FIGHT TB SUPPORT YOUR TB ASSOCIATION |". Machine slogan cancellation: "KINGMAN, ARIZ. FEB 24 1965 | FIGHT TB SUPPORT YOUR TB ASSOCIATION |". 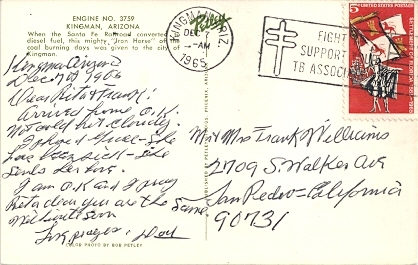 Machine slogan cancellation: "KINGMAN, ARIZ. APR 5 1965 | FIGHT TB SUPPORT YOUR TB ASSOCIATION |". 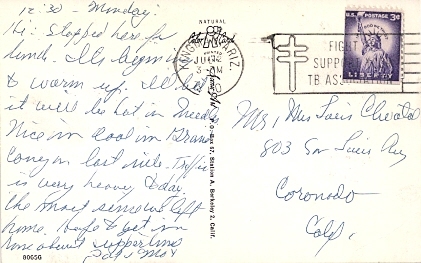 Machine slogan cancellation: "KINGMAN, ARIZ. JUN 10 1965 | FIGHT TB SUPPORT YOUR TB ASSOCIATION |". 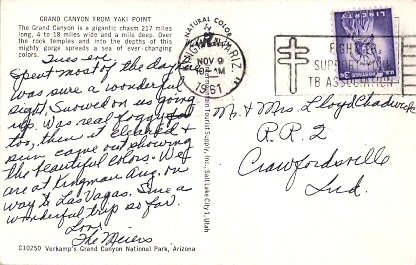 Machine slogan cancellation: "KINGMAN, ARIZ. DEC 7 1965 | FIGHT TB SUPPORT YOUR TB ASSOCIATION |". 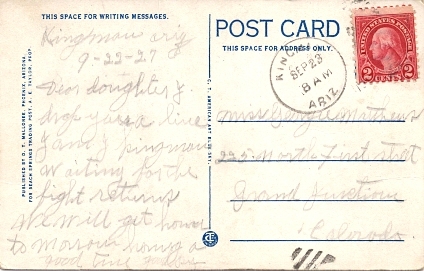 Machine cancellation: "KINGMAN, ARIZ. SEP 11 1967". 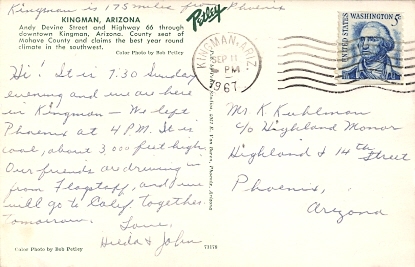 Machine cancellation: "KINGMAN, AZ 86401 OCT 16 1968". 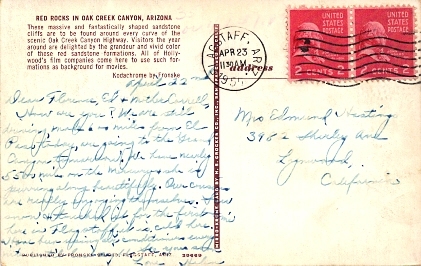 Hand cancellation: "OATMAN, ARIZ. SEP 27 1931". 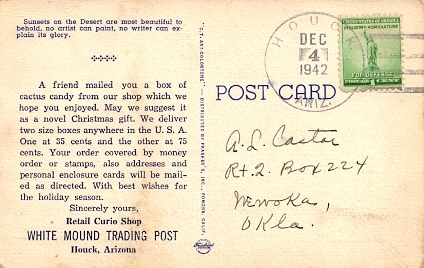 Hand cancellation: "OATMAN, ARIZ. NOV 2 1938". 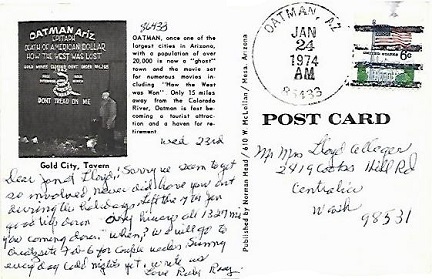 Hand cancellation: "OATMAN, AZ 86433 JAN 24 1974". 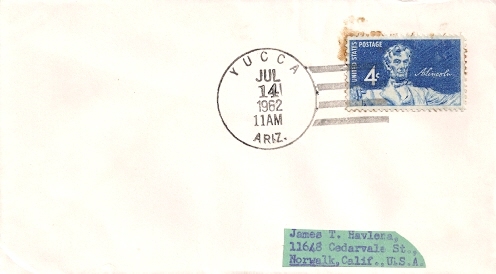 Hand cancellation: "YUCCA, ARIZ. JUL 14 1962". 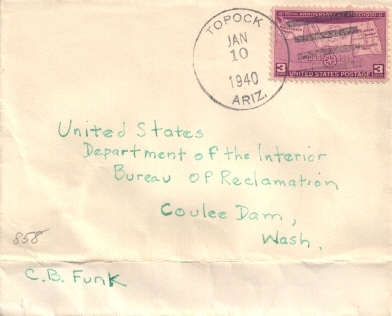 Hand cancellation: "TOPOCK, ARIZ. JAN 10 1940". 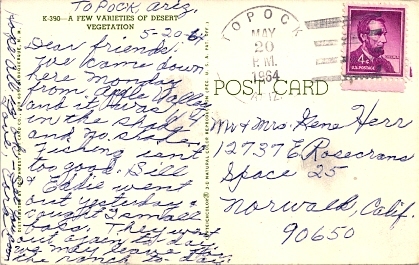 Hand cancellation: "TOPOCK, ARIZ. MAY 20 1964". 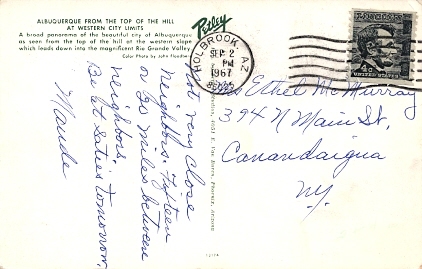 Hand cancellation: "TOPOCK, AZ 86436 APR 3 1965". 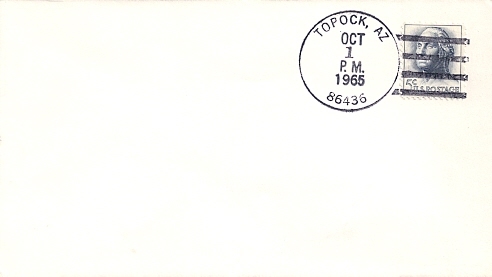 Hand cancellation: "TOPOCK, AZ 86436 OCT 1 1965". 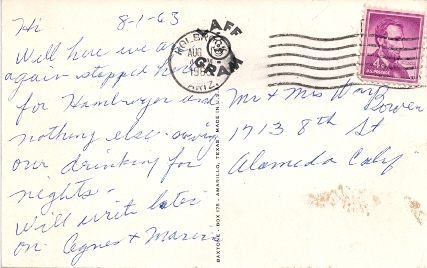 Hand cancellation: "TOPOCK, AZ 86436 JUN 24 1974". 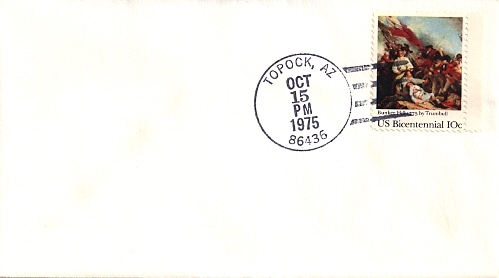 Hand cancellation: "TOPOCK, AZ 86436 OCT 15 1975". 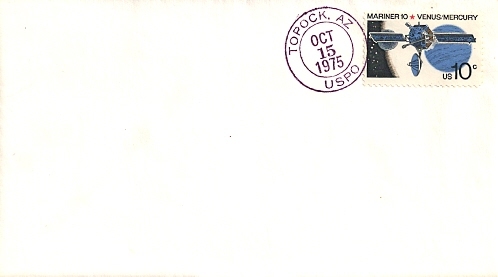 Hand cancellation: "TOPOCK, AZ USPO OCT 15 1975".